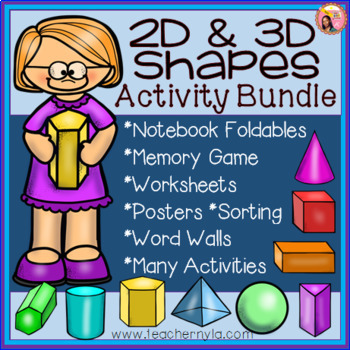 This is a 2D and 3D Shape Megabundle of Activities and Worksheets for Grades 2 to 5 with Common Core. This is a geometry combo of my 2D and 3D Shape products. The preview is just for one of the files in the set. *Updated 6th Feb 2016* - I have included my new 'I Have Who Has' 3D shape game and I updated most of the other files with additional content and some revisions. So please re-download the file for your new copies. - Nyla. ❶ 3D Shape Flash Cards with Venn Diagram Sorting Activity with large Venn Diagram rings for attribute sorting. ➋ Illustrated 3D shape Word Wall set which includes the following words: cube, cuboid, sphere, cone, cylinder, triangular pyramid, square based pyramid, triangular prism, solid, 3D shape, face, edge, and vertex. It also has illustrations and real world pictures of each shape on each word card. 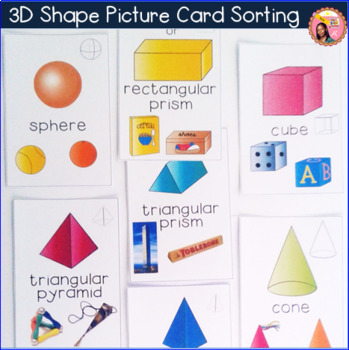 ❸ 3D Shape Memory Card Game - A memory game for all of the these 3D shapes - sphere, cone, cube, cuboid, cylinder, triangular prism, rectangular pyramid, and triangular pyramid. ❹ 3D Shape Dominoes Game - Students will match the cards with the names of the shape to to the cards with the picture of the same shapes. 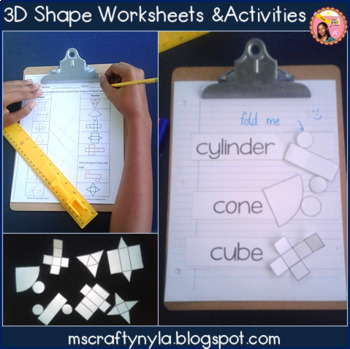 ❺ 'All You Need to Know about 3D Shapes' tutorial and activity book with nets of each shape for you to cut out and let your students make solid shapes as their own classroom manipulatives. Also included are activities for the properties if each shape. ❽ Illustrated Polygon Word Wall set which includes 10 illustrated Polygon word cards. The file formats are PDF files. 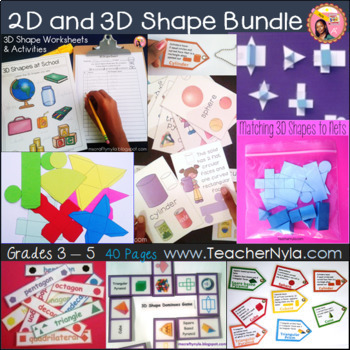 As a little bonus my free Nets of Cubes Activity Sheets are also included in this bundle. ☝ You can use this Geometry reading list for your students to learn about shapes while they read.